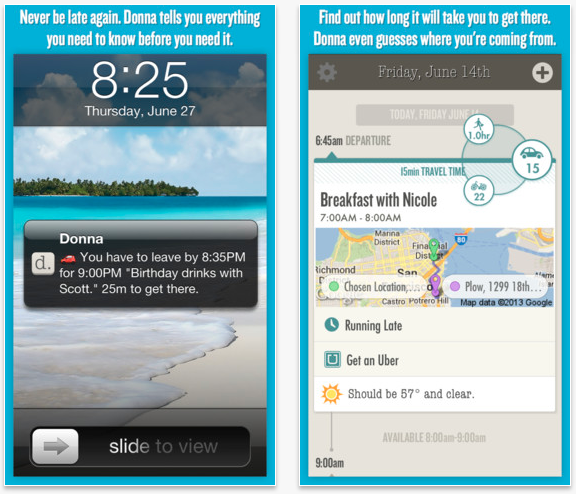 Donna, the smart personal assistant, has arrived in the Apple App Store for all to try. This is much more than a calendar app — it’s a service that could seemingly function as a surrogate to a real-life person helping you manage your day. Originally launched in beta back in April, Donna is the brainchild of Incredible Labs, run by Kevin Cheng, Scott San Fillippo, Arshad Tayyeb, and Spence Murray, and is built to anticipate your needs and help you get to your meeting in the most efficient time possible. Whether that’s telling you when to leave for the meeting, how to get there by car, bike, or walking, or even communicating with others, Donna can do that. Now yes, when you first look at Donna, the first thing you might think about is that it’s just another productivity and calendar service just like Tempo, Fantastical, Sunrise, and EasilyDo. Cheng says that, contrarily, his app cares more about being proactive and giving users a human experience that’s more about technology. I’ve used Donna for a while and I must admit that that I was fairly skeptical about the app — after all, I was already using Tempo so did I need another app to give me the same information? But what’s interesting about Donna is that it became my secretary, almost like Dawn from Mad Men who helps Don Draper out at the agency. Conference call push notifications with support for GoToMeeting, Skype, and WebEx. Back-end support to accommodate scaling so it will never have to implement the dreaded “waiting list” policy. Enhancements to its intelligence so that Donna will be able to better predict where you’re going and when you will be there. One of the things Cheng says was Donna’s biggest problems during its beta testing was the fact they didn’t do a good enough job explaining how smart the app really was. The app focuses on more than just the minutia of being at a meeting, but rather helps execute the logistics of it. The app is an ever-learning service that will be able to remember that you head home everyday at 5pm and tell you when to leave. It also has a feature that enables you to summon an Uber to get to your next event. When you input an address in there a variety of ways, it will be able to decipher it and know that you’re talking about the same venue. Its processing capabilities are fascinating to say the least. Some features you might not even notice, as they’ll appear only when they’re needed. For those not on an iOS device, an Android version of Donna is expected. Incredible Labs raised $2.5 million in funding in January for the app.